ACA Unveils the Completed Interior Design for an Extra Care Development in Silksworth, Sunderland, for Abbeyfield. After the success of our interior design Extra Care scheme in Bingley, we have had the great pleasure in continuing to work with Abbeyfield on another Extra Care development. The scheme is designed to enhance comfort amongst residents by emanating a “homely” environment. The driving influence of the design was to create a positive, safe environment. 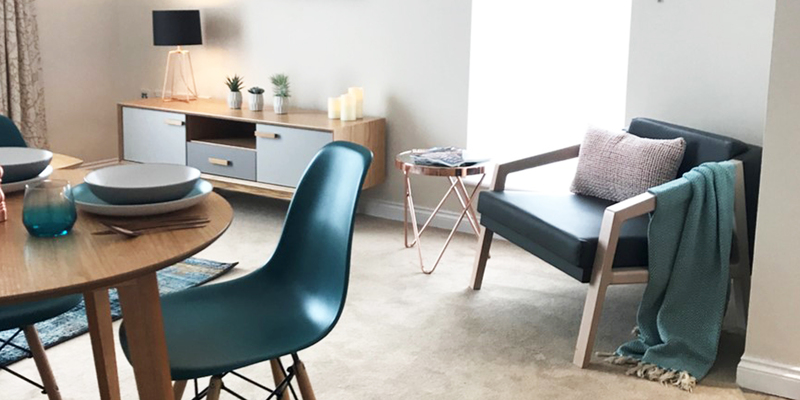 ACA sensitively designed a modern and refreshing interior, tailoring it to aid couples where one of them may be experiencing early-onset symptoms of Dementia or similar. The design takes into consideration the rich, fulfilled lives that people have experienced and provides a respectful and dignified place to live. There is a strong arts and culture scene in the area. Consequently, art pieces from a local artist have been installed to act as visual memory aids. Materials have been thoughtfully selected to provide a calming atmosphere. Furniture and equipment with different functions are highlighted in different colours to aid the day-to-day obstacles people may experience. Colour selections were inspired by iconic paintings of the local surroundings. Floral prints on curtains provide an extra element of visual stimulation. To Read more about this project click here.